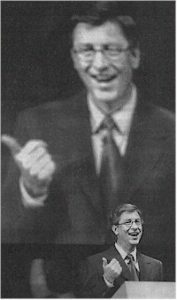 This first appeared on the Firmware website (sadly no longer with us) under my <<Thinktag>> column title in 1998. While I’d modify some of my smart arse comments today, it captures a time of media change nicely I think. And there’s now bigger images on some if you click. I called this the Citizen Kane shot. You see it often. 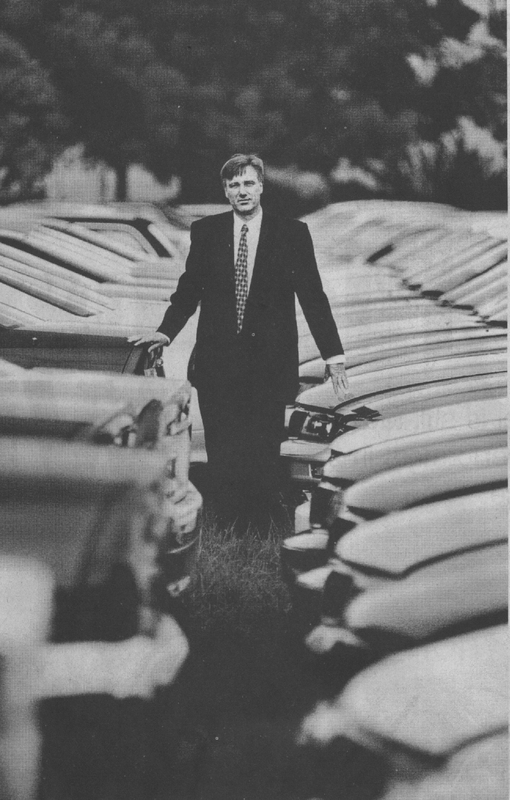 Ever been photographed for the trade press? By the publication’s photographer? I’m really interested to know, because, even though I’ve tarted around the ‘multi-media’ business for a while, I’ve usually been ‘behind’ the publication, as writer or editor, and my choice to be anonymous is assured. 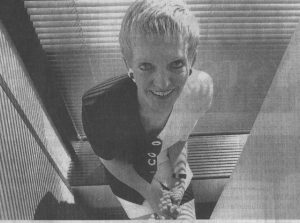 For the rest of my ‘appearances’ there have been a few standard PR portraits that are trotted out when someone asks (or were sent off by agencies when I changed jobs/hats). 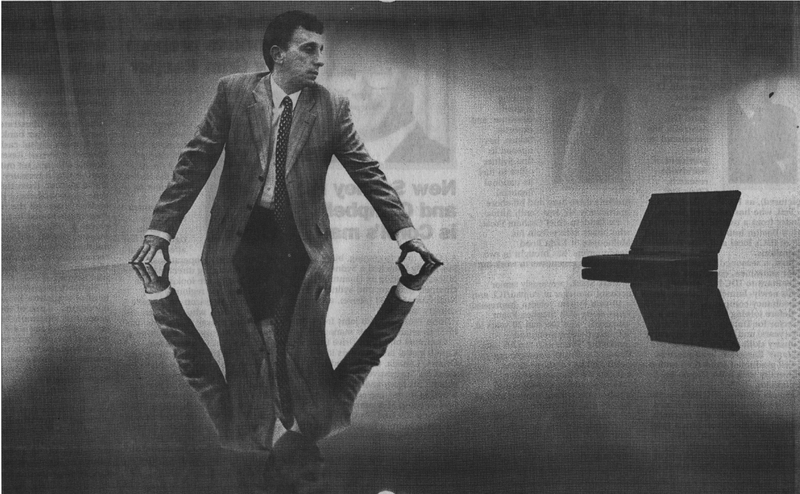 The caption: ‘Peter Donnelly and Frank McKenna, who entered into the agreement between Datafile and GMB Records and Information Management Solutions’ A nice touch is the still life with product boxes and coffee cup. Will you let go now please? 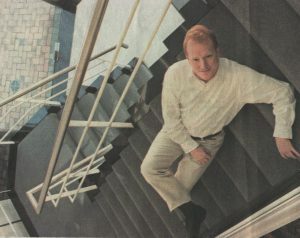 The caption reads “Datafile Managing Director Mr Phillip Evans outside Datafile’s new headquarters in Frederick St., St Leonards. 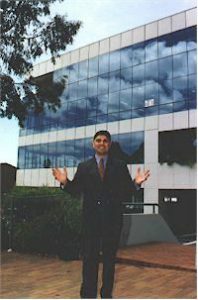 The new location and expanded space complement Datafile’s recent expansion, including Australia manufacture of its colour-coded filing products and growth in its range of computer-based products”. File this, colour-coded, under Silly Poses Managing Directors Should Avoid, and put it and its caption, in our PR Photos That Will Never Run So Save the Postage folder. Are you sure you can see the logo? Well, we can see it almost Chris. Nice smile though. By themselves they were clever , enmasse very funny. Because the client supplied pictures are bad, if the editors of the publications want to run the story, they’re forced to take their own accompanying photographs. If it’s for the weekly IT newspaper sections, the pressure is on to make an appointment, get the photo, process it and lay out the story, before deadline. In a matter of minutes into the appointment, the photographer has to grasp the gist of the story, find an appropriate place for the photo, and get as pleasing a result as they can. They don’t know the layout of the page, can’t tell if the shot will be on the growing number of colour pages or in black and white, or guess if the format should be vertical, horizontal or square. I sympathise and empathise. It’s a tough call. When the result works it’s great and is then almost immediately forgotten, when it doesn’t it looks silly and only the subject really suffers. What ever happens, there’s still the same number of pages to fill next week. This article tries to slow down the cultural churn, and think about how those press pictures portray us as computer users and IT people. It also offers some flippant, and some serious, suggestions as to how you can have a say in how you are portrayed in the media. 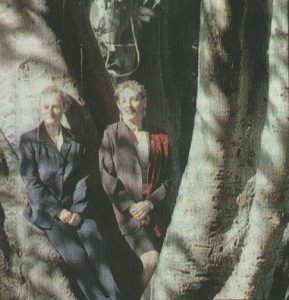 The photographs are obviously much smaller than they appeared in print, a bit rough and have mostly been scanned from two week’s issues of the computer sections of The Australian, The Age, and The Sydney Morning Herald. Oh, so that’s what it looks like. When computers were new and still evolving into their current dreary shapes, we really wanted to know what they looked like. Computer magazines then, as now, didn’t have pictures of people using computers, just lots of shots of the hardware itself. The exception was if it was a novelty to have someone ‘important’ use one. 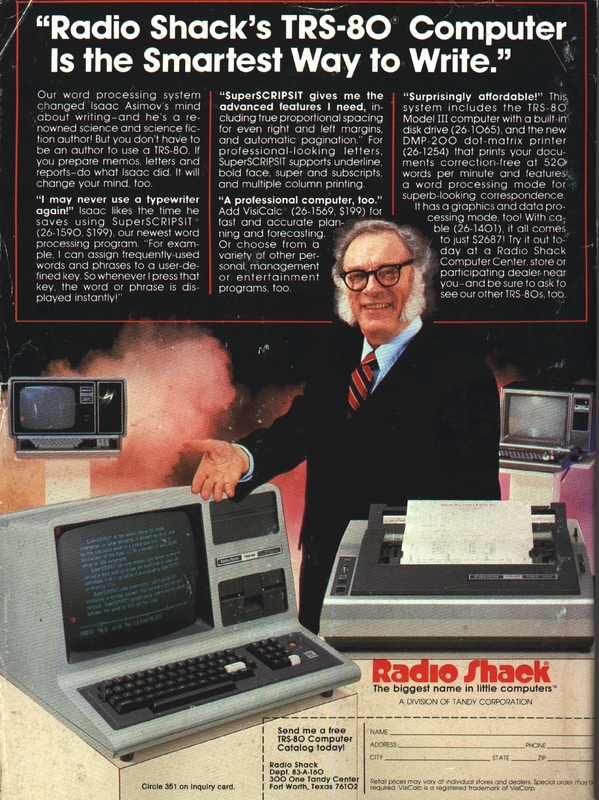 One such story was of Isaac Asimov who gave up his electric typewriter for a Tandy Model III, (an event that was seized on, or planted, by the Radio Shack marketing department and turned into this, with Isaac as one of the most improbable computer ad presenters ever). From then to now, photographing the user at their computer you faced a common problem. You can show the person at their computer or with their computer, but if you wanted to show what was on the screen of their computer, you had one choice of view. You had to photograph them from a three-quarter angle so that you could see them and the screen. At best they just looked awkward, at worst, ridiculous as they squinted sideways, holding their heads to the camera and trying to look like they could really view the screen from that angle. 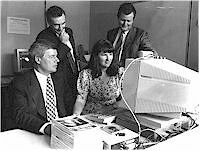 If you wanted a shot of your work team and have them all looking at the computer, it required even more novel solutions. 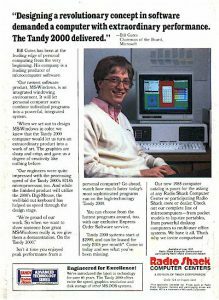 We do know what his printer is like though, the view from his window, that he’s very attached to his mouse and that he’s way cool because he programs in Visual Basic. 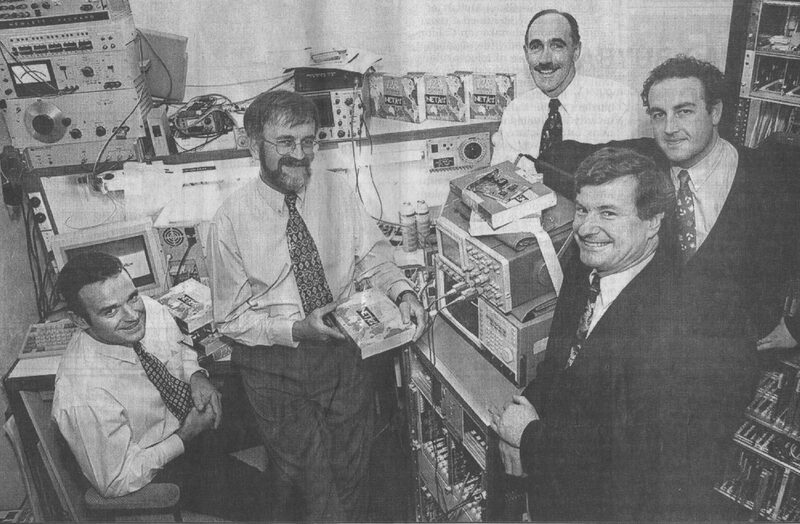 Another PR shot, where we see not only the team but those interesting ports, external SCSI drive, and a whole lot of those really neat wires that refuse to go down the back of the desk. We can only guess at what’s onscreen. 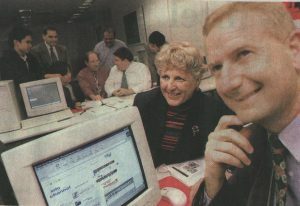 Cinema Papers #51, May 1985 Here is Margot Brock (seated) and Pat Crozier working as production accountants for Bob Weiss. Does Margot always have her screen on that angle? The computer was er.. probably an S100, running CPM. I’m not without blame, as that Cinema Papers photo shows. (I took most of my own photos to accompany the articles I did for Cinema Papers, mainly because there were no PR shots at all for the material I was covering. 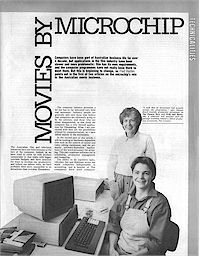 This article was a two part examination of how the film industry was just starting to use computers for scriptwriting, scheduling, budgeting and production. The pictures all included hardware because it was still interesting to see what people used – that doesn’t apply anymore ). After many dreary years of variations on that three-quarter pose, (I’ll spare you the chronicle) it was obvious that a change was due. 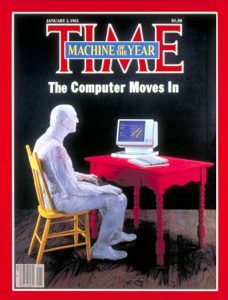 After all a computer was TIME magazine’s 1982 ‘Man of the Year’. 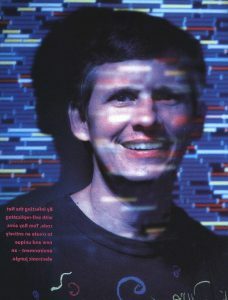 In my archives is a special edition of National Geographic on the phenomenon of Silicon Valley. All the pictures are lit with primary coloured lights, pumping as much drama as they can from someone holding a microchip. The coloured cross lighting is an industrial photography cliche that has mercifully passed. It was to take another ten years of indifferent coverage… and suddenly there was WIRED magazine. 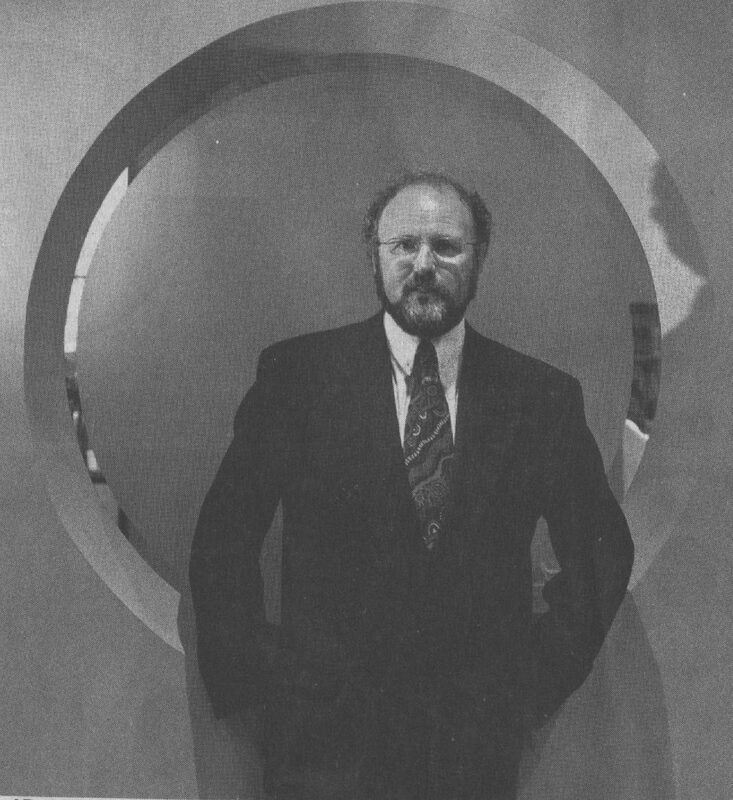 Bill Zemanek photo. WIRED Sept/Oct 1993 (issue 4) Zemanek, a San Francisco based advertising photographer who hung out with EFF members, featured in the early issues of WIRED. 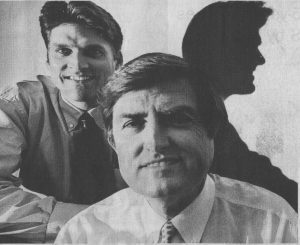 This blur / filter pic of ILM’s Mark Dippé and Steve Williams was indicative of a style that was soon replaced by the ‘Don’t pay for a photographer, just give me any old pic and a few Photoshop plug-ins’ school of illustrating their articles. In itself this didn’t set a new style in representing computer users, but it gave permission to treat anything other then the text (but not the hardware shots which stayed clean and advertising safe) as a graphic. 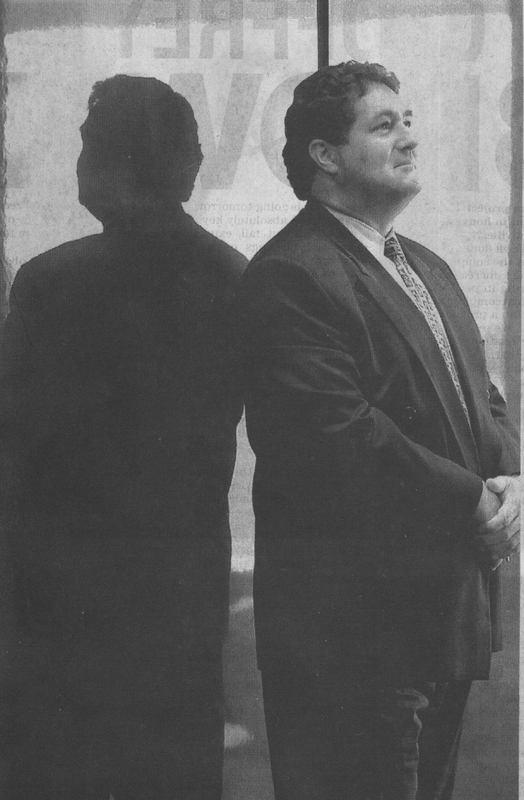 Zemanek’s photograph of Tom Ray from WIRED Feb ’95, is an ‘in camera’ version of the overlay that became a WIRED graphic cliche. This is another photo variation when the subject isn’t significant enough for the Citizen Kane treatment mentioned earlier. It’s usually a speaker at a conference, who after the session is persuaded to stand in front their PowerPoint presentation on the video projector. Tip: Avoid projected colour images that make it look like you’ve got a skin disease in black and white. Compare this awkward person (“just move to your left a few inches so we get ‘tele’ on your forehead, now without moving your head look across at me and can you hold a smile because it’s a slow exposure”) with the ‘Paul Budde the respected analyst’ shot at right, taken that same day by James Alcock from The Age April 28 ’98 Perfect pose and placement of telco analyst Paul who was then wildly building his media presence. Tip: You’re in control. If it feels silly, it will look silly. It was not as a direct result of how WIRED portrayed users and computers that brought the change, but the context they were placed in. Founders Rossetto and Metcalfe were just smarter then most on picking up on the groundswell. WIRED followed failed attempts like the (then recently reborn, no gone) glossy OMNI, and increasingly sophisticated treatment in magazines like New Scientist and Popular Science. But it was WIRED that gave us confidence that computers really were a serious and important agent of commercial and cultural change, and should be treated as such. 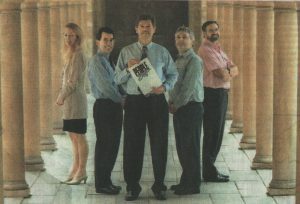 Now we had media permission that it was ok to be geeks, and for the business people involved to be treated as legitimate. For all its faults, it radically changed computer magazines, and with them, the weekly IT sections of the newspapers. This has lead to a conflict in the representation of IT in the press. Business people now get the same treatment as in the financial pages. Respectful photographs that point to their position as responsible money makers, now alternate with those of the actual users in our weekly doses of print. 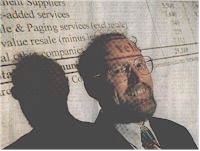 The inventiveness of the staff photographers sometimes flags when faced with another portrait of a CEO, as a quick listing of the following cliches show. (Remember, there’s no malice here, just vicarious interest. The photographers names are given first). Stand by, we’re going to ram. 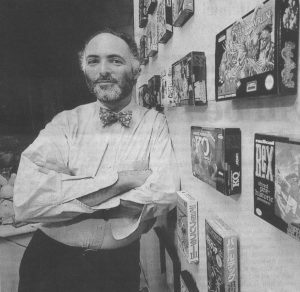 The caption to this picture says, Sole Survivor: Johnathon Sheiman of Ipex Computing. I’d suggest that the caption came as much from the picture, then the article text about tough times in local PC makers sales. 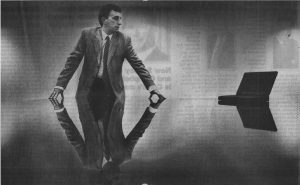 Great symmetry, pose and balanced use of the product, and the only thing that lets it down is the newsprint bleed from the page behind. It really pisses the photographers off when a great shot suffers in reproduction, but this is photography for newspapers, not magazines. 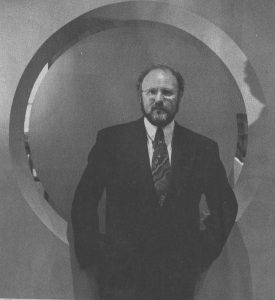 Beside himself , Geoffrey Brown is posed almost leaning against the glass. Looks awkward doesn’t he? Nice reflection though. It’s not a cliche, it’s an epidemic. 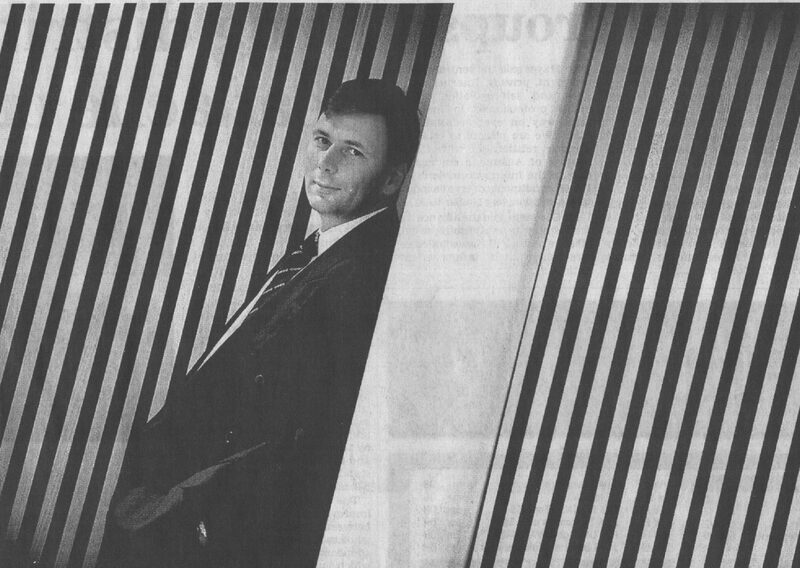 On three consecutive pages of the June 9th The Australian, examples of ‘The Lean’ combined with the reflection and architectural device. What’s the editor to do when the shots come in? Probably just shake their heads and run them. Johnathon Hicks from .. well, you guess. The ‘out-of-focus’ company logo cliche also gets it’s moment here. 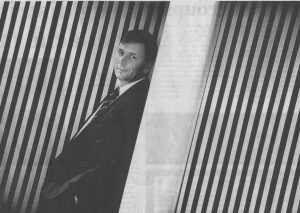 David Thodey from IBM gets a sophisticated graphic treatment. Tip: Stand up straight, get your hands out of your pockets, and someone please look for Alfred’s cuff links. Who are these Americans with strange pointed heads and weird shadows? Marcus Cuthbert and Gary Strzinek from Periphonics, the caption says. 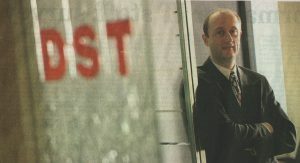 There’s no photographer’s credit on this almost German Expressionist shot, of Microsoft’s NT server marketing manager Peter Moore. Surely that was an oversight, or doesn’t anyone want to take the blame? Tip: Another example of, if it feels stupid, don’t do it. All of which are viable in the photographic poses tool kit, and all of which can be lifted from the cliche by a good photographer. Here’s a couple from those same weeks. 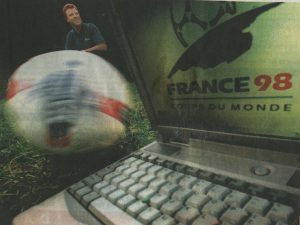 Used big, this shot just leapt off the page, the subject was Craig McWilliams who is tech support at Sybase and working on the World Cup press info system. I don’t know whose idea it was but Brett Faulkner got it just right and caught the moment. Surprising and fun. 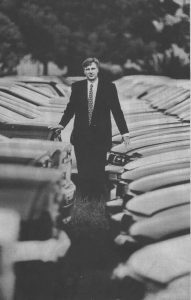 Brian Charleton The Age June 2,’98 Accompanying a story that could have been passed over as ‘so what’, this image of Peter Harrison from Mitsubishi broke an IT mould heading for Fin Review. The picture ran a column wider than the two column story, and deserved to. When they appear week after week and on consecutive pages, it adds an unwarranted feeling of hack journalism and lowers the tone of the paper. 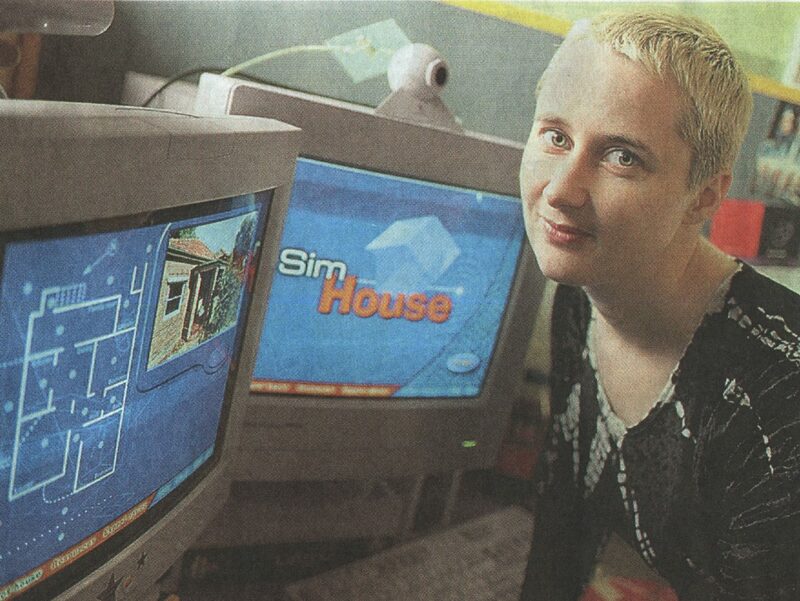 I always pretended I was writing for a magazine. Can you lean in a bit closer to the monitor? It’s a problem when the onscreen image will tell part of the story, and the photographer can’t get the person in close relationship to it. 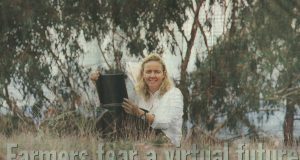 There had to be a better solution then to get UTS IIM project leader Cindi Drennan to stick her head ostrich-like further into the frame. Repeat Tip: If it feels awkward to you, it will look awkward. You can’t take it with you. The portable computer as a prop. 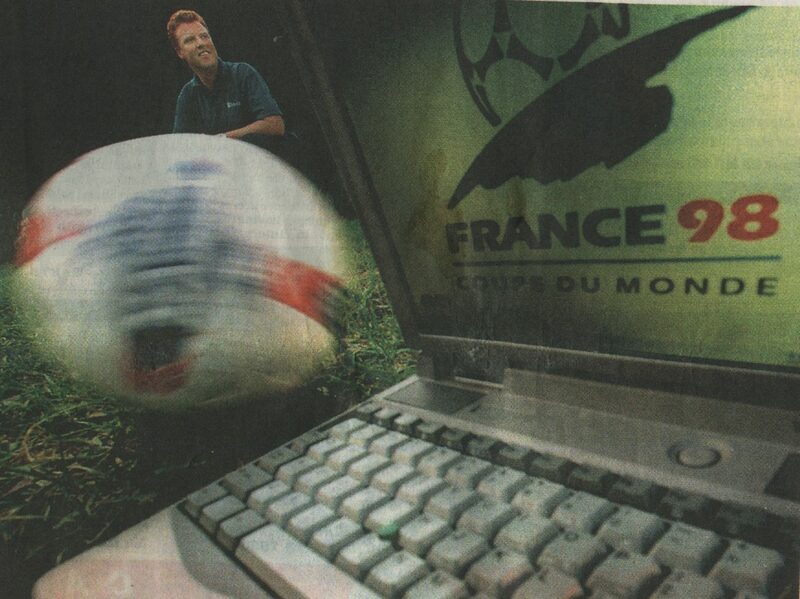 The portable computer immediately offered a new set of photo opportunities. We saw the beach, bush and bistro as settings for what we began perversely calling a portable office. Most were settings where it would be impossible to see the screen , or to type at all, and it’s become a cliche deserving its own examination. We all know what a portable display is like, why do the photographers continue as if they don’t? Tip: Tell Rosie Simpson from NFF Farmwide shown here, that you can get grass seeds out of the serial ports with a blast of compressed air, but cowshit stains the plastic case forever. Are you old enough? Ok. Stand in front of this serious hardware. You don’t often get a warts and all shot of the tech guys in the back room. Tidying up would probably put the project back a year. I’ve noticed that the only time we do get to see behind the scenes, is when there’s a boffin or two involved. 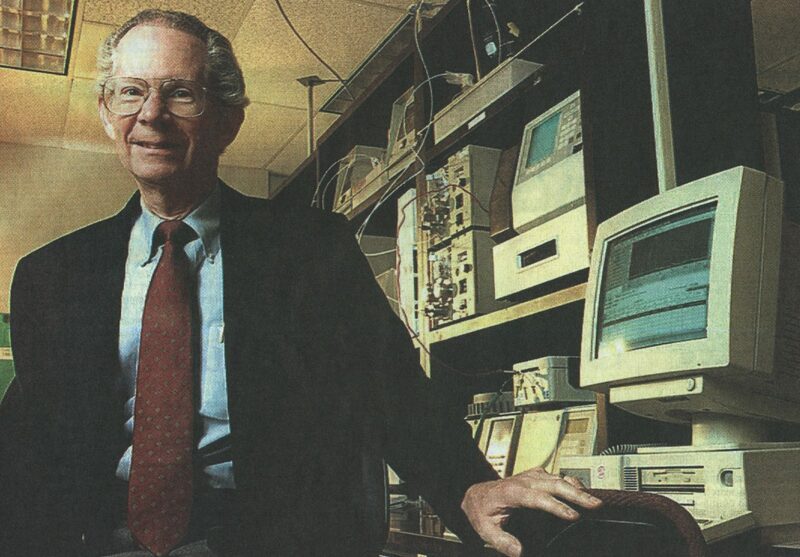 There must be young tech guys, but for some reason we only see the older guys. Is it an absent minded professor cliche? 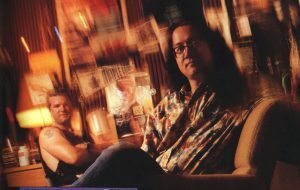 The classic back room boys shot. A nicely controlled team photo, with a row of carefully arranged product boxes along the bench behind being the only concession to ordering the tech chaos. That’s me down the back! The team shot, trickiest of all. This has to be the hardest of the IT shots to get and make interesting, for every good one there’s lots of misses. Sometimes the photographer can do it right and can’t help when the subjects get it wrong. Here there’s a nice composition with the strong Vivo er sorry… Zivo logo and yet, except for Mike Sherry in front, they all look like poseurs and grinning fools.Tip: If you’re short, don’t be the guy at the back. And never pose with your jacket over your shoulder. Sometimes, it all clicks as in the Peoplesoft team shot here. There’s a formal pose, formal columns yet it all looks like fun and the subtle colour makes it. One that’s not so funny is Misogynists Inc.
I’m sure Johanna Plante .Chief Executive of ACIF didn’t realise she was being treated as a mongoloid graphic object. Nice converging lines but I know why the photographer didn’t want a credit on this. Awful. 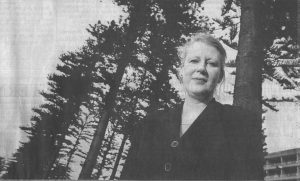 Margaret Hopkins is from a new Qld. 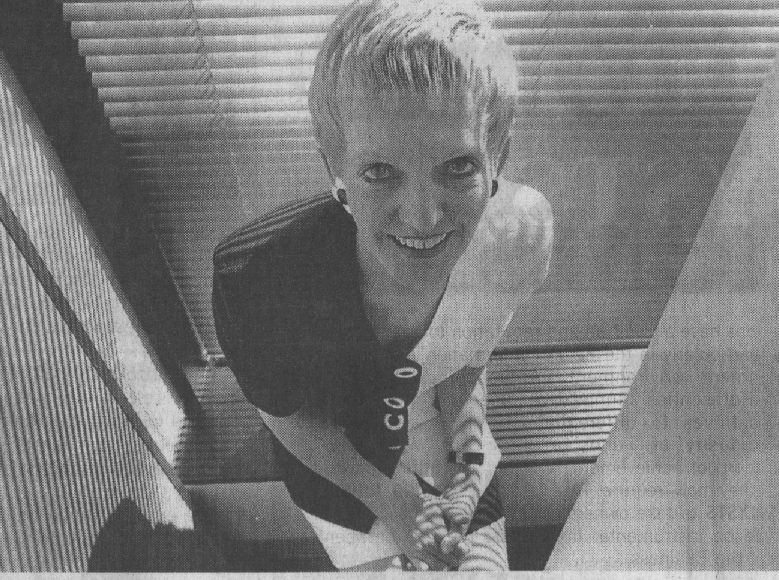 IT Recruiting company, and is given respectful treatment in the article by Sylvia Pennington. 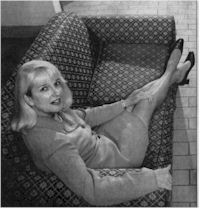 A pity someone didn’t warn her about the wide angle and ‘bimbo on the couch’ pose. 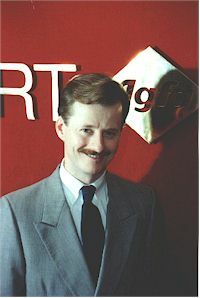 Would the photographer have photographed a man like that? It suggests that there’s a ‘boys club’ agenda, where visual equality and respect are not available to women in the industry. In a story about electronic hospital records, it’s only a small step in logic to photograph Data General’s corporate marketing manager Heidi Brown in front of a tree. Not unflattering, except for the wind blown hair. Maybe it’s the Earth Mother approach as below. Claire Murray and Ricci Swart are too media savvy to turn into wood nymphs, so it’s hard to imagine why they should be camouflaged in the gardens like this. The Age and SMH sometimes use the same pic twice, once in colour, small on the masthead, and then larger in black and white inside. The black and white pic of Claire and Ricci had a nicer vertical composition but you can imagine what the grey newsprint version looked like. Where did they go? Is there a conclusion to all this ? Most of the awkward cliches each week result from the lack of any understanding by the subjects of how the camera will see them. That’s in spite of our regular diet of Tuesday’s IT sections. Then there is the subject’s lack of communication with the photographer, and a dumb puppy desire to be helpful and do anything they’re asked. The opportunity to have your ego stroked shouldn’t overwhelm any thought of a personal or business message you might want the publicly available image to portray. If you expect quality, then allow enough time for the photograph. If you are in communication with the editor, offer an approach or opportunity that they might use. They’ll tell you if it’s silly and if they do, listen to them. Don’t be afraid to take chances if the photographer makes a creative suggestion but it’s ok to ask if the pose or angle will communicate what you want. And if you’re having your photograph taken in a group, don’t be the geek with your jacket slung over your shoulder. Yeah, you know who you are.